This festively colorful nebula, called NGC 604, is one of the largest known seething cauldrons of star birth in a nearby galaxy. NGC 604 is similar to familiar star-birth regions in our Milky Way galaxy, such as the Orion Nebula, but it is vastly larger in extent and contains many more recently formed stars. This monstrous star-birth region contains more than 200 brilliant blue stars within a cloud of glowing gases some 1,300 light-years across, nearly 100 times the size of the Orion Nebula. By contrast, the Orion Nebula contains just four bright central stars. The bright stars in NGC 604 are extremely young by astronomical standards, having formed a mere 3 million years ago. Most of the brightest and hottest stars form a loose cluster located within a cavity near the center of the nebula. Stellar winds from these hot blue stars, along with supernova explosions, are responsible for carving out the hole at the center. The most massive stars in NGC 604 exceed 120 times the mass of our Sun, and their surface temperatures are as hot as 72,000 degrees Fahrenheit (40,000 Kelvin). Ultraviolet radiation floods out from these hot stars, making the surrounding nebular gas fluoresce. NGC 604 lies in a spiral arm of the nearby galaxy M33, located about 2.7 million light-years away in the direction of the constellation Triangulum. M33, a member of the Local Group of galaxies that also includes the Milky Way and the Andromeda Galaxy, can be seen easily with binoculars. NGC 604 itself can be seen with a small telescope, and was first noted by the English astronomer William Herschel in 1784. 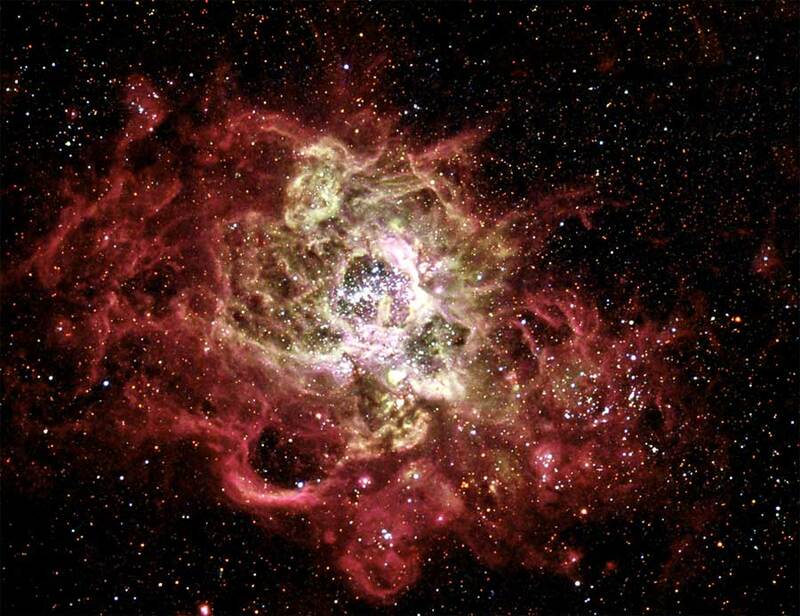 Within our Local Group, only the Tarantula Nebula in the Large Magellanic Cloud exceeds NGC 604 in the number of young stars, even though the Tarantula Nebula is slightly smaller in size. NGC 604 provides Hubble astronomers with a nearby example of a giant star-birth region. Such regions are small-scale versions of more distant "starburst" galaxies, which undergo an extremely high rate of star formation. Starbursts are believed to have been common in the early universe, when the star-formation rate was much higher. Supernovae exploding in these galaxies created the first chemical elements heavier than hydrogen and helium. The image of NGC 604 was assembled from observations taken with Hubble's Wide Field Planetary Camera 2 in 1994, 1995, and 2001. Color filters were used to isolate light emitted by hydrogen, oxygen, nitrogen, and sulfur atoms in the nebula and ultraviolet, visible and infrared light from the stars within NGC 604 and the nearby spiral arms of M33. Image processors from the Hubble Heritage team at the Space Telescope Science Institute combined these various filter images to create this color picture.